This sequel to A Critical Cinema offers a new collection of interviews with independent filmmakers that is a feast for film fans and film historians. Scott MacDonald reveals the sophisticated thinking of these artists regarding film, politics, and contemporary gender issues. The interviews explore the careers of Robert Breer, Trinh T. Minh-ha, James Benning, Su Friedrich, and Godfrey Reggio. Yoko Ono discusses her cinematic collaboration with John Lennon, Michael Snow talks about his music and films, Anne Robertson describes her cinematic diaries, Jonas Mekas and Bruce Baillie recall the New York and California avant-garde film culture. The selection has a particularly strong group of women filmmakers, including Yvonne Rainer, Laura Mulvey, and Lizzie Borden. Other notable artists are Anthony McCall, Andrew Noren, Ross McElwee, Anne Severson, and Peter Watkins. 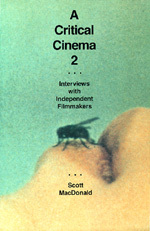 Scott MacDonald, editor of A Critical Cinema: Interviews with Independent Filmmakers (California, 1988), has written for Film Quarterly, October, Afterimage, Wide Angle, and Cinema Journal. He is Professor of English at Utica College in Utica, New York.